I'm not ordinarily a big fan of Oncidiums and their relatives -- objectively, I can be impressed by how many blooms, or an unusual color, or something, but I think my preferences run more toward single (or few) very large and elaborate blooms, instead of lots of smaller, simpler ones. When I come across an exception to that general rule, though, it tends to be a doozy. The ID on this one is confusing and uncertain. Of course. In 2008, I posted a photo of an orchid we were selling at the ex-job, which was tagged as Odontoglossum 'Margarete Holm,' but it didn't look anything like this -- different color, different pattern, smaller blooms. 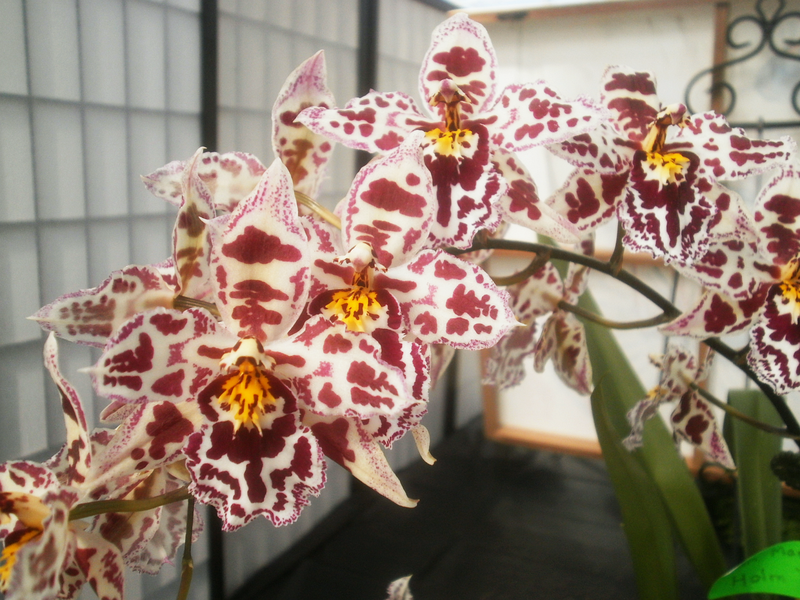 And, obviously, Odontoglossum, instead of Odontocidium. The orchid registry where I usually get my ancestry information gives two results for "MargaretE Holm," but neither one is listed as an Odontocidium, so I don't know which one is the plant in the photo, or whether either of them is. one is an Oncostele (syn. 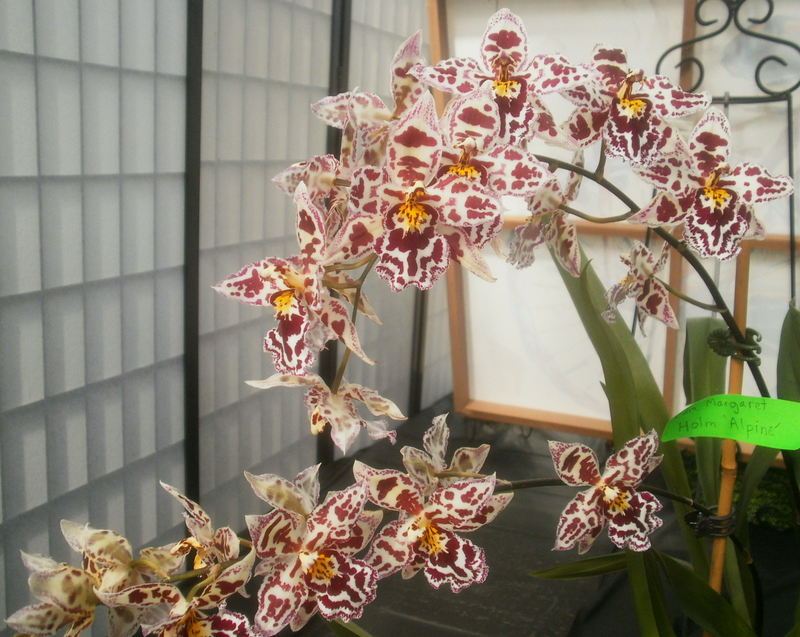 Odontoglossum), registered in 1983, and the other is an Oncostele (syn. Odontioda), registered in 1988. The site doesn't have photos to go with the listings, which is understandable (it would be a lot more work, and it's hard to confirm the identity of a plant in a photo unless it's very distinctive or common), but that also leaves me without a way to choose one or the other. An online image search leads me to think that it's probably the 1983 cultivar, making this actually an Odontoglossum instead of an Odontocidium as tagged, though that preference is based on a single Pinterest post. Ideally, one would like to have something a little more solid to base the guess on. I also found a Garden Web thread about a plant that sort of looks like this but with blooms that lean more to the pink/purple side than the dark red in my pictures. That one was sold as Margarete Holm 'Alpine.' A Garden Webber comes down on the Odontoglossum/1983 side, but . . . Garden Web is only barely more trustworthy than Pinterest, and only one commenter weighed in, so I wouldn't, like, want to bet someone's life on that being true. And none of this explains the photo I took in 2008, which pretty clearly seems to be a different plant than this. In any case, I like these photos -- if anything, the photos make it look better than it did in person -- and this was one of my favorite orchids at the 2015 show. Next up, another Anthurium, this time no. 0255 "Steph N. Wolfe." Hopefully it will be less confusing than this. I had one of these for several years but it "passed away" a couple years ago. Been trying to track one down since then. Do you know of one that is for sale? Thanks! Sorry, I don't. Google might know.